Want A Bullet-Proof System To Accomplishing All Of Your Goals...In Just 7 Minutes A Day? Do you wish you could be more productive each day? Do you have hopes and dreams and goals locked away inside of you? Are you too busy to actually sit down and work on your goals? 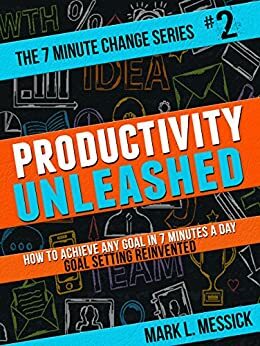 Never fear, Productivity Unleashed is here! 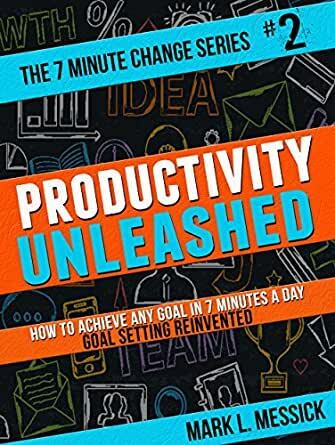 In Productivity Unleashed I'll take you by the hand and lead you step-by-step through my never-before-seen, completely original goal setting system. This dead-easy system will skyrocket your productivity and allow you to accomplish every goal you've ever dreamed of. Scroll Up & DOWNLOAD THIS BOOK NOW. The Art of Clear Thinking: Mental Models for Better Reasoning, Judgment, Analysis, and Learning. Upgrade Your Intellectual Toolkit. Where to begin. haha. First I will say that I liked the "relevant" content of the book. As a goal-setting nut, I liked the twist he puts on goal setting and achieving your goals and it definitely fits my way of thinking. I like to see the big picture and have a map to guide me there. The way he describes developing a map to reach your goals is very different from anything else I've read. It's definitely something I will incorporate in my life and I plan on seeing huge benefits from doing so. If you've never spent time writing out your goals, then this is a good book to start with. Now the bad... This guy is the definition of ADHD and it shows from the beginning to the end. One chapter was almost unbearable to read because most of it was him jabbering about everything under the sun but the topic at hand. I can only guess that he ran out of his adderall the day he wrote that. :) The author talks about how the book is 35,000 words but in reality, at least 50% of the book is useless filler. And probably 49% of the 50% is him talking and making crazy jokes about everything under the sun. Literally, he goes from one topic to another in almost every paragraph. If he cut all the crazy stuff out, you could read this book in under an hour. At times, I was begging for this book to be over and/or for him to get to the point! I've never yelled at a book before, but this is one that was driving me nuts. If it wasn't for the fact that the "REAL" content was something I was interested in, I would have deleted the book off my kindle and cursed him while doing it for wasting my time. At certain points, I think he writes these books just so other people have to listen to him go on and on. I paid 99 cents for the book and that's a good price for it. Anything more and I would have asked for a refund for having to listen to him. haha. I know I am going on about this, but if you read the book, you will understand what I mean. Ok.. I am done with this part of the review! All in all, if you are into goal setting or want to be, this is a good book to consider. Just have a punching bag handy to get out your frustration while reading it. I must agree with the other reviewers who found this book infuriating. Most of it can be skim read without missing anything. He spends a lot of time trying to be funny, but, unfortunately, fails. He goes on and on and on, and the "rabbit trails" are endless and long. On the up side, he's only 16 years old. That said, he has 11 books here on Amazon. If my 11 year old writes that many by 16, I'll pat her on the back! What an accomplishment! The problem is that while he may have gotten his productivity down to some degree, he hasn't learned the craft of writing. He has plenty of time to learn that if he decides to stay this course and keep writing. I almost wonder if he would enjoy a marketing career more. There are some tidbits here, but nothing you won't find elsewhere in at least-as-useful-forms. But then I've read many productivity books and still think the classics are considered classics for a reason--not least of which is that they are well-written and too the point. The other issue I'm pondering over is the truth of the statement on this page that he makes four thousand dollars per month in royalties from his books. This seems extraordinarily unlikely. All his books on Amazon are "selling" for free, except four which are selling for 3.99 each. None of them are ranked higher than 200,000 on the bestselling lists. There are top bestselling authors that aren't even making minimum wage, so I am extremely skeptical of his claim. I also wouldn't say he's all that productive. Yes, for a 16 year old, I'll say he is, but considering that his books read like run-on sentences, he obviously didn't spend that much time on them, so, if it is also true he doesn't go to school and perhaps doesn't have a house, kids, or bills to look after, what does he do with the rest of his time? These points are only relevant to this book because he's writing one on productivity, so it seems fair to judge his ability to be productive. It seems that his ability to be productive isn't necessarily so good and his writing isn't so good, nor did it really present new ideas, so this book wasn't really worth my time. But all that said, I don't think he should necessarily give up on writing. He has done a lot, now he just needs to spend some time studying writing and doing more work with his chosen topic so that people don't bypass his writing based on his presentation and scarcity of information. 5.0 out of 5 starsThis Book Gets Five Stars and Two thumbs Up - As Usual. I have read and enjoyed all of this authors books on writing. This is the first book on productivity that I have purchased by him. I was extremely pleased after finishing reading this book. mentioned in this book was absolutely unique and new to me. It is a creative solution that is easy to implement by anyone. This book (like all of this authors' book) are very easy to read through. throughout. I read it all in one sitting. The book came with a few printable worksheets that make the exercises even easier to do. There was also a free online tool that was mentioned that helped in making me faster at typing. This is important for all of you who are aspiring to write your own books like I am. more than anything I keep reading his books because I resonate with his "voice" and writing style. I believe that you get to meet authors from the words they write. provides extremely helpful tools and techniques. missed the 1st book in this series. That will be next on my reading list.